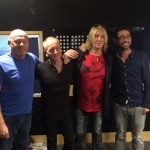 Def Leppard members Joe Elliott and Phil Collen were interviewed by Talksport's Colin Murray today about the Wembley Stadium NFL show. The Oakland Raiders will play the Miami Dolphins at Wembley Stadium on Sunday 28th September. Kick off is at 6pm. The band will play around 22 minutes before kick off. In the 16 minute interview Joe and Phil talked about Vivian's health, the 1992 Dublin/Wembley shows, the NFL show, the NHL Ice Hockey show in 2008, Sav playing football for Sheffield United, the band members favourite football teams, the band's longevity, American success, 2015 album, UK shows in 2015, Sheffield questions, the moment they knew they'd made it big, 80s concert riders and meeting famous sports stars. Joe and Phil explained that the setlist will be a medley of some of their greatest hits. They also commented on Vivian not being there. BTW Joe has said tonight the band will start at 5:38pm. The appearance was announced on 26th August by the band in a video message on NFLUK.com. Listen to the full 16 minute interview via the link below. As shown below Joe and Phil were photographed whilst in studio. Joe - "Yeah that's his big thing. You gotta- it's a sight to behold and he's just sat there on the bus. Seven hours just laptop and every time you look over his shoulder there's a different car on. You know he's just crazy about cars. Absolutely crazy about them." Joe - "22 years. It's ironic actually that the performance on Sunday, which by the way it's not half time it's pre game. It's the first gig in 22 years that we'll have done without Viv. And the first gig we did with him was at Wembley for the Freddie Mercury Tribute show. Save for a little rehearsal show in Dublin." Joe - "No it wasn't it was at McGonagle's. Yeah it was about as big as this room but it was good. It was great but you know we unveiled him to the world at the Freddie gig." Joe - "Well we've got a short period to play so we're kind of doing a bit of a squashed up medley." Phil - "Cram 'em all in." Joe - "No we won't. It is interesting I remember watching Prince do the half time Superbowl about five years ago and he did a Foo Fighters song and he only had 15 minutes. I'm thinking that's brave cause he's got like 7,000 hits you know and he goes and does that." Phil - "So we're doing a Nirvana song." Joe - "We figured we'd do a Prince and a Nirvana song."